November is here, which means that Thanksgiving is just around the corner. 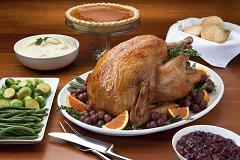 When most people think of Thanksgiving, they think of turkeys, parades, football and three lovely days off of school. But let us not forget that the true meaning of this holiday is, as the name suggests, giving thanks. And this Thanksgiving, the thing I am the most grateful for is, without a doubt, pointlessness. You may be wondering why pointlessness is so important. Merriam-Webster defines something as being pointless when it "has no meaning, purpose, or effect." Unimportance being important appears to be, by definition, contradictory. What I mean by acting pointlessly is to do things that do not seem to serve any higher goal. But why bother doing something if it is, in fact, pointless? This is actually my second draft of this article. My first draft was a horribly bitter rant about all of the problems I see around Rose. Upon re-reading that draft, I realized that what I had written was not an expression of my own beliefs, but was instead a manifestation of my stress. I decided to scrap the first article entirely because no one wants to read my anxious ramblings and because quite frankly, my first article sucked. A lot. Why, you may ask, am I so stressed? Because between college applications, GPA, SAT scores, ACT scores and the myriad of other school activities, everything has become incredibly pointed. From 9th grade onward, we are told not to take the classes we are interested in, but to instead take the classes that will fulfill certain credit requirements or that will look good on a resumé. Accepting that everything I do now counts towards something bigger than high school has been one of the hardest pills for me to swallow in my entire high school career. That is why it is so important to be pointless. Even though it seems like everything you do right now carries terrifying weight in determining the rest of your life, keep in mind that you are in high school: you aren't supposed to have everything figured out. Your fondest memories of these four years will not be of making a hundred on that test or making straight A's on your report card, they will be of going to the homecoming football game or prom with your best friends, things you can't put on any resumé.